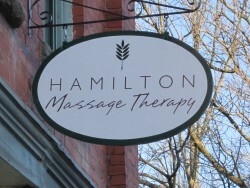 Hamilton Massage Therapy - established in 2009 - is owned and operated by Jackie Schiavone. Jackie is an experienced therapist and a 2003 graduate of the Onondaga School of Therapeutic Massage in Syracuse, New York. We are located in the historic Roth Building in downtown Hamilton, New York, directly across from the Colgate Inn and just minutes from Colgate University. Put Yourself in Our Hands - Over 30 Years of Combined Massage Experience!! Friday - 11:00 a.m. - 3:00 p.m.
Saturday & Sunday - 1:30 p.m. - 5:30 p.m.
We now offer appointments 7 days a week. You have several ways to schedule your appointment. Call/text 315-725-8962, email jjsmassage@msn.com or you can schedule your own appointment online. Go to www.schedulicity.com or you can click on the link on our Hours and Scheduling Page. © Copyright 2019 Hamilton Massage Therapy. All rights reserved.